Check that the reservoir tank engine coolant level is within the “MIN” to “MAX” when the engine is cool. Adjust the engine coolant level if necessary. CAUTION: Refill Genuine NISSAN Long Life Antifreeze/Coolant (blue) or equivalent in its quality mixed with water (distilled or demineralized). To check for leaks, apply pressure to the cooling system using suitable tools (A/B). Testing pressure : Refer to CO-25, "Radiator". WARNING: Do not remove the radiator cap when the engine is hot. Serious burns could occur from high-pressure engine coolant escaping from the radiator. Wrap a thick cloth around the cap. Slowly push down and turn it a quarter turn to allow built-up pressure to escape. Carefully remove the cap by pushing it down and turning it all the way. Do not spill engine coolant on drivebelt. Higher test pressure than specified may cause radiator damage. If engine coolant decreases, replenish radiator with engine coolant. Refer to MA-11, "Fluids and Lubricants". If anything is found, repair or replace damaged parts. WARNING: Do not remove radiator cap when engine is hot. Serious burns could occur from high pressure engine coolant escaping the radiator. Wrap a thick cloth around the cap. Slowly push down and turn it a quarter turn to allow built-up pressure to escape. Carefully remove the cap by pushing it down and turning it all the way. Open radiator drain plug at the bottom of radiator, and then remove radiator cap. 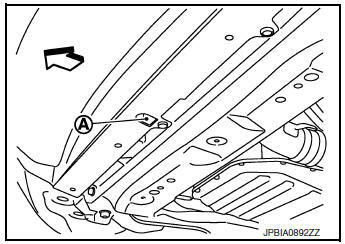 Do not allow engine coolant to contact the drive belt. 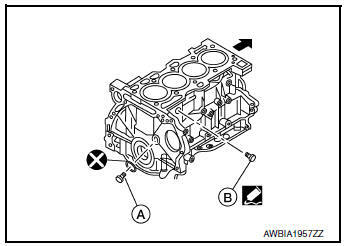 When draining all of the engine coolant in the system for engine removal or repair, remove the engine coolant drain plugs (A/B) from the cylinder block. If the engine coolant is contaminated, flush the engine cooling system. Refer to CO-11, "Flushing". Do not put additive such as waterleak preventive, since it may cause cooling waterway clogging. When refilling use Genuine NISSAN Long Life Antifreeze/Coolant (blue) or equivalent in its quality mixed with water (distilled or demineralized). Refer to MA-11, "Fluids and Lubricants". The radiator must be completely empty of coolant and water. Apply sealant to the threads of the cylinder block drain plug. Use recommended coolant or equivalent. Radiator drain plug : Refer to CO-13, "Exploded View". Insert the refill hose into the coolant mixture container that is placed at floor level. Make sure the ball valve is in the closed position. 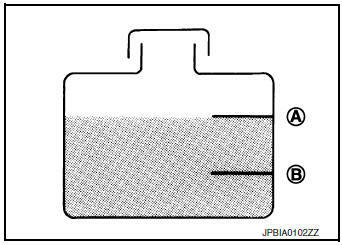 Engine coolant capacity (with reservoir tank) : Refer to CO-25, "Periodical Maintenance Specification". CAUTION: The compressed air supply must be equipped with an air dryer. The vacuum gauge will begin to rise and there will be an audible hissing noise. During this process open the ball valve on the refill hose slightly. Coolant will be visible rising in the refill hose. Once the refill hose is full of coolant, close the ball valve. This will purge any air trapped in the refill hose. Place the coolant container (with the refill hose inserted) at the same level as the top of the radiator. Then open the ball valve on the refill hose so the coolant will be drawn up to fill the cooling system. The cooling system is full when the vacuum gauge reads zero. CAUTION: Do not allow the coolant container to get too low when filling, to avoid air from being drawn into the cooling system. Install reservoir tank, if removed, and radiator drain plug. Be sure to clean drain plug. If water drain plugs on cylinder block are removed, close and tighten them. Refer to EM-92, "Exploded View". Run the engine and warm it up to normal operating temperature. Drain water from the system. Refer to CO-8, "Draining". Repeat steps 1 through 5 until clear water begins to drain from radiator.